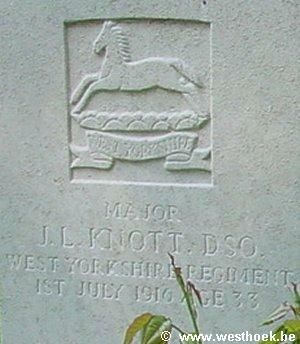 Major JAMES LEADBITTER KNOTT DSO 10th Bn., West Yorkshire Regt. (Prince of Wales's Own) who died on Saturday 1 July 1916. Age 33. 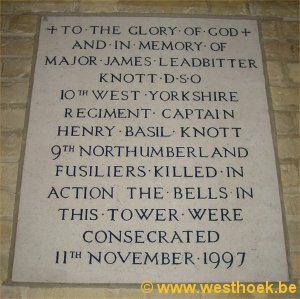 Major JAMES LEADBITTER KNOTT DSO 10th Bn., West Yorkshire Regt. (Prince of Wales's Own) who died on Saturday 1 July 1916. Age 33. 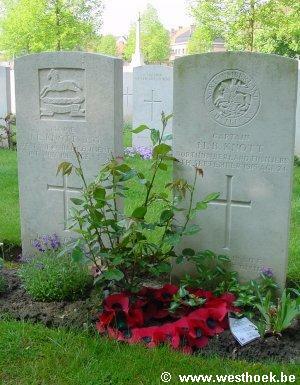 Son of Sir James Knott, 1st Bart., and Lady Knott, of Close House, Wylam-on-Tyne. YPRES RESERVOIR CEMETERY Grave V. B. 15. Grave reference V. B. 15, Ypres Town Cemetery. “War Office, 3 Jun. 1916. His Majesty the King has been graciously pleased to approve of the undermentioned rewards for distinguished service in the field, dated 3 June, 1916.” His name is listed below. Jim was born on Saturday 2nd December 1882, elder son of Sir James Knott, 1st Baronet, and Lady Margaret Knott, of Close House, Wylamon-Tyne, who was Member of Parliament for Sunderland in 1910. He was educated at Eton College as a member of the Reverend Henry Daman’s and Mr Hugh Vibart Macnaghten’s Houses, leaving in 1900 and then travelled extensively in North America. He was appointed Deputy Managing Director to his father in The Prince Line, a shipping company in Newcastle. Like his father, Jim took a great interest in politics and was selected as the Conservative Prospective Parliamentary Candidate for Liberal-held constituency of Hyde. In 1916 a by-election was called in the seat but Jim gave up the opportunity of being the candidate so that he could remain at the front. At the outbreak of war Jim volunteered and was gazetted and went into training with his brother at Bovington. He was promoted to Captain on Saturday 21st November 1914. Early on Wednesday 14th July 1915 Jim arrived in Boulogne and entrained at 3.50pm for Lumbres. He marched with his men to billets in the Ouve area. Jim marched to Arques on Sunday 18th and after resting overnight moved to Steenvoorde. After the tiring march all ranks were delighted to have two days rest before continuing the march across the Belgian border to La Clytte, arriving in the early hours of Friday 23rd. All ranks were sent into the trenches in front of Kemmel for practical training with experienced, battle-hardened troops. On Monday 26th Private Arthur Hall was mortally wounded and died the next day; he was the first to be killed from the Battalion that brought home to everyone the reality of the Western Front — he is buried in Westouter Churchyard and Extension. The Battalion began its first tour of duty in its own right on Monday 2nd August in the line between the Vierstraat to Wytschaete road and the Verbrandenmolen. At 10.45am a bombardment of the line began and at 11.10am the enemy blew a mine close to ‘B’ Company that wounded Lieutenant Maidlow and four of his men, however two German soldiers were killed! A week later Jim transferred north to support an attack at Hooge. A welcome break from the front line came early on Saturday 14th August when Jim arrived in La Clytte for twelve days of rest and training. When not instructing or organising his mens activities Jim was able to visit Bailleul and enjoy the cafés, concerts, restaurants and other facilities that abounded in the town. The reality of the Western Front returned on Thursday 26th when he marched with his men from La Clytte to relieve the Border Regiment in the front line near ‘Dead Dog Farm’, St Eloi. The Battalion remained in the sector until the end of October when they were sent to Hooge that was described: “The trenches taken over were in a very bad condition. They had all suffered heavily from both our own and the enemy’s shellfire during the fighting between the end of July and the 25th September. Several trenches had been entirely destroyed and in the support and reserve lines it had not been possible to reconstruct them. North of the Menin Road the trenches varied from 80 to 20 yards distant from the enemy’s front trenches. The large crater blown up on June 10th, when the 3rd Division attacked, is 80 feet across and 40 deep. The inside has been constantly shelled and some hundreds of men are buried in it. On the line south of the Menin Road there is a gap of 200 feet between C.1 and C.3 trenches. It has never been possible to reconstruct the intervening trench C.2 as it is constantly destroyed by enemy fire. Zouave Wood is a mass of debris and broken trees. The enemy opposite are Wurtemburgers and regiments from Alsace.” Jim was relieved on Monday 1st November; he spent the rest of the month on tours of duty in the sector. The first ten days of December were spent in reserve at ‘York Huts’ before returning to Hooge for a tour. Jim and his men were looking forward to some rest in their camp at Busseboom, where they had arrived on Wednesday 15th December, but due to a gas attack they were stood to. Christmas Day was spent out of the line but Jim was back on duty in the trenches on Boxing Day where a raid was countered later in the evening. Jim left the trenches of the Salient on Friday 7th January 1916 and after a series of marches with his men took them to Ruminghem where training continued until Saturday 5th February. He returned to a camp in Reninghelst on Monday 7th, a week later Jim was about to march to the line at St Eloi when the enemy blew a mine under ‘The Bluff’ so the relief was postponed. It was not until 6.00pm did the Battalion relieve the 10th Battalion Lancashire Fusiliers. Jim continued fighting in the sector and on Monday 28th February the Brigade Diary recorded: “10th West Yorkshire’s Intelligence Officer has sent in reports of considerable value as to the enemy’s works on the Bluff, which has enabled the artillery to destroy them. This officer, and the Intelligence Officer of the 7th Yorkshires, also discovered some enemy strong points opposite the trenches held by their Regiments. These are being destroyed by the siege battery.” Following a terrific bombardment on Wednesday 1st March the Battalion was involved in a fierce fight and lost one hundred and twenty officers and men, killed and wounded. (2) Clearing Fricourt Wood as far as Willow Trench and the track leading N.N.E. to X.28.C.8.0 as soon as the barrage on the west front of Fricourt Wood lifts (i.e. 2nd Zero plus fifteen minutes from S.W. edge of wood and 2nd Zero plus one hour forty-five minutes from a parallel line 150 yards back from edge of wood). The 10th West Yorkshire Regiment will co-operate with the 7th Yorkshire Regiment against both objectives. Jim was originally buried alongside Lieutenant Colonel Dickson in Fricourt New Military Cemetery. After the war he was reburied with his brother, see above. If you are reading this letter is means that this war has demanded the extreme sacrifice from me, and my object in writing is to bring you as far as I can, some measure of consolation and courage and patience to bear your sorrow. It is not in any sense a message from the grave because whatever I may or may not doubt, I have very complete faith in the Life Eternal. I know that I will be with you when you are reading this, and I want you to realise, and always remember that, although Providence has been decided that I may not return to you in the flesh, that I shall be always with you in the Spirit sharing your joys and sorrows. I feel compelled by my knowledge of you both to write this, because my own great anxiety at the present time is the possibility of your collapse if I follow ‘Pomp’. Momentous events are looming up and I have a premonition that I may not return to you. I have been dreaming of Basil recently, and I have an indistinct recollection of a letter in Basil’s handwriting dated June 1916, which I feel is his warning message. If I am correct then you will both know Basil and I are happy. I hope and desire above all things that you will unduly grieve. You must not think harshly of me for refusing to accept safe employment, even if my action results and your sorrow. We have all to show courage — those out here in facing the music and taking what comes in a stoic manner — those at home in facing the loneliness that must follow the casualties of severe fighting. I do want you to know and realise how deeply and whole-heartedly I have appreciated and loved you both for your unselfish devotion and all-forgiving love. My life has been one uninterrupted period of all that a man could wish for or desire. If I die now I am content to do so. Life is sweet, and holds out all that a young man could desire — power, wealth and above all, great love, but I want you to know that I faced the future fearlessly, and that I was cheerful and satisfied. My medals are yours but I should like them destroyed when you both join me — whenever that may be. Always remember that I am relying upon you both to be good brave parents, and that I can only be really happy in a new life if I know and can see that you are happy too. My clothes, furniture and motor car must all be immediately disposed of, everything which reminds you of my death must be removed — this is my urgent desire and wish. God grant that you will be given health, strength and happiness for many years. Jim left an estate of £104,350 2s 0d (approximately £8,738,269.00 today). He is commemorated on several memorials, see his brother above for further details. Jim was recorded in Debretts Obituary — War Roll of Honour published in the 1921 edition.